This recipe is one of my go-to vegan/vegetarian favorites, and it's really accessible, easy, and fast. Here is what you'll need: tomatoes (preferably cherry tomatoes), eggplant, zucchini, squash, garlic, onions (preferably yellow or white), olive oil, tomato paste, salt + pepper, chili flakes for a little spice, and if you'd like, a starch of choice. I always choose pasta for this, because I love pasta. 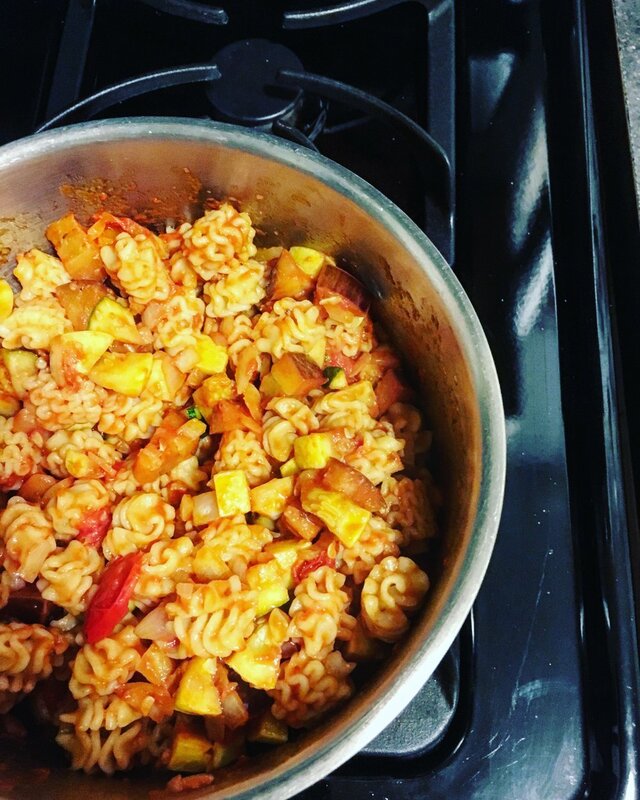 I buy my pasta in bulk either from Whole Foods or from my farmer's market if it's in season. During the spring, summer and fall, I buy tomatoes in bulk from my farmer's market. During the winter, I try and switch to larger heirloom tomatoes so I don't purchase cherry tomatoes in packaging. However - sometimes the cherry tomatoes in packaging are local, and the heirloom tomatoes have traveled a long distance. Here is what I'm saying: there are a lot of sustainable steps that move us in the right direction. Our economic, agricultural and food systems are not circular. Sometimes packaging is a reality, sometimes waste is a reality, sometimes non-local, non-organic, non non-GMO is a reality. Make the best choice you can. I buy my other vegetables from my farmer's market or from Whole Foods depending on the season. I buy olive oil + tomato paste in glass containers and I either recycle or save the containers for future use. I've made tomato paste a few times. That is also absolutely plausible for this recipe. First, rinse and prep your vegetables. Next, saute your onions in olive oil over low heat. We want to lightly saute the onions to begin to cook them down without caramelizing them. Saute the onions for about 5 minutes, until they begin to cook down and emit a sweet aroma. At this point add your garlic and allow to saute for another minute or two. Garlic has a very low cooking temperature and we don't want it to brown. Once the two ingredients have cooked down, remove them from the heat and leave until they can be incorporated with the remaining vegetables. Begin to saute your eggplant, zucchini and squash with olive oil over medium heat. This dish is largely based on cooking down your vegetables and allowing the water + other liquids to help create a sort of stew. 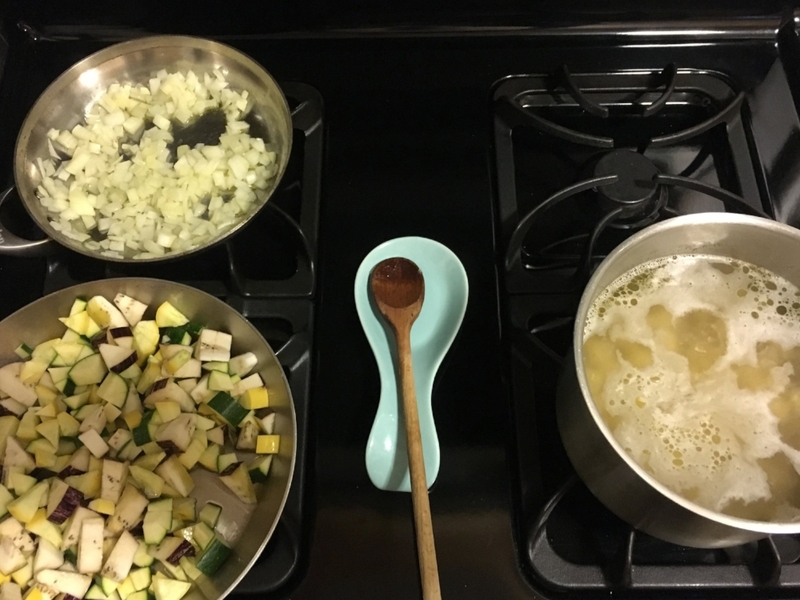 Once you have started sauteing your vegetables, turn on a pot of water to high heat, eventually adding your pasta once the water comes to a boil. I like to add a dash of olive oil and salt to the pot of water to aid with the pasta preparation. Once your eggplant, zucchini + squash have begun to cook down (you'll notice this because they'll get lighter in color in the center, almost as if they're transparent in the middle and they'll begin to soften up), add your halved tomatoes to the mixture. Tomatoes cook down really quickly and they have a high water content, which helps aid in the stew-like consistency of this dish. You'll notice that the pan acquires a much higher liquid content once a few minutes have passed. At that time, incorporate a few tablespoons of tomato paste, until the mixture has enough water content to bubble. Once your vegetable mixture is bubbling, go ahead and add your onion + garlic mixture and let the entire mixture continue to cook down for another 3 minutes or so. You want it to be lightly bubbling, a good balanced ratio of solid to liquid, and smelling mildly sweet + Earthy. This is also the point to add any salt, pepper or chili flake you might want. Check your pasta and gauge preparation. Remember, pasta prep is often about preference. I'm not an al dente fan, so I like to cook my pasta until it is nice and tender. Strain your pasta, and return to the pot. Finally, incorporate your ratatouille with your starch (in this case pasta!) and serve! If you're a vegan, boom, you're done. If you're not, I think this dish is pretty tasty with some freshly grated parmesan cheese. If all goes well, this dish should take you 20-30 minutes to prepare from start to finish. Let us know if you have questions or comments and, as always, enjoy!